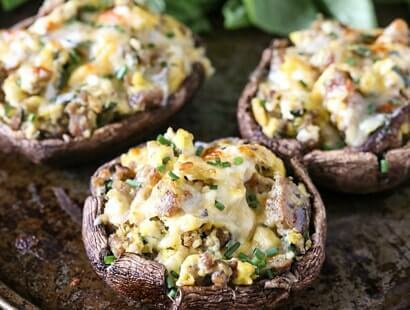 Portobello mushroom caps are stuffed with scrambled eggs, savory breakfast sausage and sharp cheddar cheese. Great for a breakfast buffet. Preheat oven to 400ºF and line baking sheet with parchment paper. Remove stem and gills from underside of mushrooms. Make sure there is enough space to fill them up with eggs. Rub inside of mushroom caps with olive oil and roast in oven for about 5-7 minutes. Just long enough to let mushrooms soften slightly, they still need to keep their shape. While mushrooms are cooking start browning sausage, breaking up with spatula. 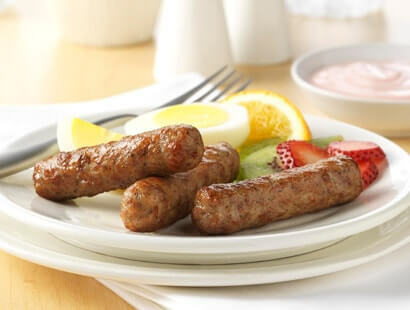 Once sausage is browned stir in eggs, basil and chives. Stirring as eggs cook. Once the eggs are fully cooked add egg mixture evenly among mushroom caps. Sprinkle each cap with 2 tablespoons shredded cheese and add back to oven for 5 minutes, or until cheese is melted.